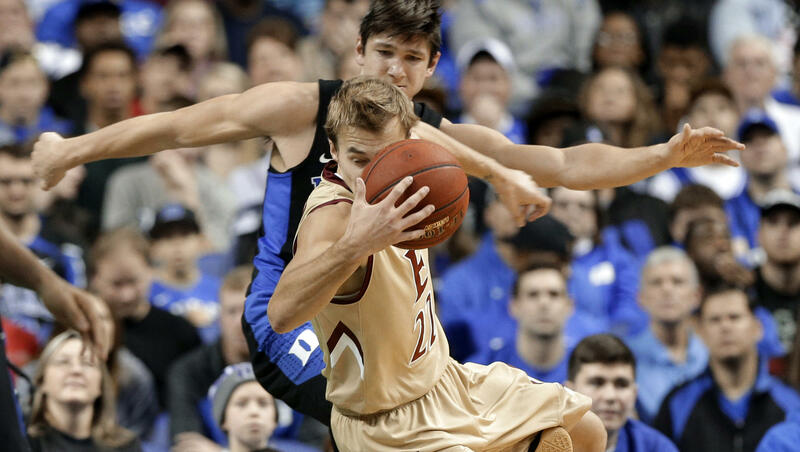 GREENSBORO, N.C. -- For the third time in a year, Duke’s Grayson Allen got caught tripping an opponent in a game. If the Blue Devils guard is going to get more punishment from coach Mike Krzyzewski for it, don’t expect to hear the details. Allen picked up a technical foul for tripping Elon’s Steven Santa Ana on a drive in the first half of a 72-61 win Wednesday night. That earned him a seat on the bench for the final 4:15 of the half and the start of the second half, though he returned to the game with about 16 minutes left. Afterward, Allen met with Santa Ana and Elon coach Matt Matheny to apologize before hanging his head and fighting back tears while talking to reporters in the locker room. Krzyzewski called it “unacceptable,” though he wouldn’t publicly reveal any other measures or reprimands. “I handle things the way I handle them,” Krzyzewski said. “I think I’ve handled this correctly and moving forward I will continue to handle it correctly, and I don’t need to satisfy what other people think I should do. CBSSports.com’s Matt Norlandersays Krzyzewski must ban Allen for the incident. Teammate Matt Jones said he tried to console the emotional Allen afterward. “I love Grayson, he’s my brother,” Jones said. “We’ve been to battle, we’ve won a (national) championship together. We won plenty of games together. So there’s nothing really you can say. It’s officially a pattern for Allen, who was twice caught tripping opponents last winter. On Feb. 9, Allen received a flagrant foul for extending his leg to trip Louisville’s Ray Spalding after he fell to the court and Spalding tried to go by him. Roughly two weeks later, Allen kicked up his left leg to trip Florida State’s Xavier Rathan-Mayes as Rathan-Mayes tried to run by from behind. Allen wasn’t called for a foul there, but the Atlantic Coast Conference later reprimanded him. The Blue Devils don’t play again until opening ACC play at Virginia Tech on Dec. 31. April 20 marks 20 years since the tragedy at Columbine High School. As we look back, we remember the survivors, who still carry the trauma with them every day. We first met Josh Lapp 20 years ago in an interview with "48 Hours." Now Lapp tells "CBS Sunday Morning" correspondent Lee Cowan how he's managed to move forward with his life.